Witchcraze: A New History of the European Witch Hunts – loudlatinlaughing – Euge! Euge! If I were alive in the 16th century, I would have been nabbed as a witch for sure. Risk factors: female, not married, and outspoken. 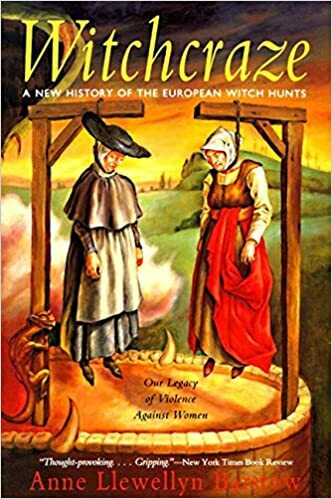 Unfortunately, this academic dive into the witch hunts of Europe and the periphery was not well done. Barstow juggles tons of studies and primary source trial documents but overlays them with her narrow 20th century perspective. Not nearly as thorough or well-thought out as it should have been. The church has a huge role in all of this, too. Clergy were jealous of women’s power as midwives and healers, usurping their own duties. And yet the church practiced its own magic as well—that turning of a communion wafer into the body and blood of Christ, for one.